Pudding, Pie or Tart — What’s a Bakewell? When I headed for the Derbyshire market town of Bakewell, I was sure I would taste the original Bakewell tart. I was even sure I knew what it looked like. I was wrong on both counts. 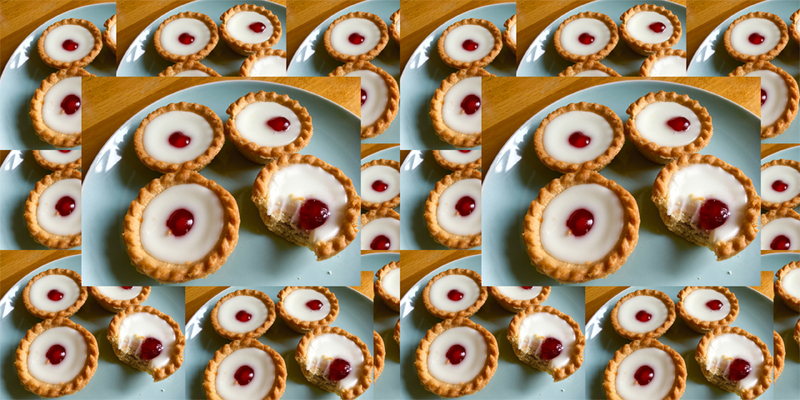 You see, you can’t get a Bakewell “Tart” of the sort we uninitiated expect in Bakewell – unless you visit the supermarket to buy Mr. Kipling’s Cherry Bakewells, a brand almost as ubiquitous in Britain as Oreos are in the USA. The mass-marketed cross between a cake and a tart, pictured above, consists of a spongy layer of frangipane baked in a tartlet case over a layer of raspberry jam, the whole lot smothered in thick white icing – sometimes striped with chocolate – and topped with a candied cherry. A nicer version, made by home cooks and bake shops all over the UK, skips the sugary icing and tops the cake-like almond frangipane with sliced almonds. 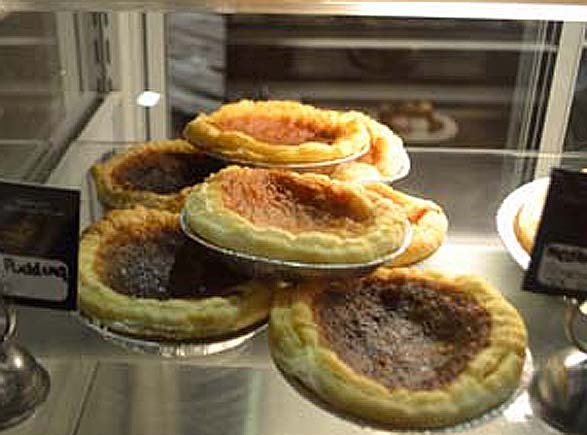 In Bakewell, near Chatsworth House, where they claim to have invented this dessert, they call it a Bakewell Pudding. It has neither a cake-like sponge of frangipane nor a thick layer of white icing. And hold the candied cherries. too. The Bakewell I was served at the Old Original Bakewell Pudding Shop was a bit of an ugly ducking to begin with. The glass counter was full of lopsided pastries looking pretty unappealing for such a famous treat. “Is that a Bakewell tart?” I asked hesitantly. Chastened, I found a seat in the suntrap terrace behind the bakery and waited, somewhat dubiously, for my pudding to arrive. 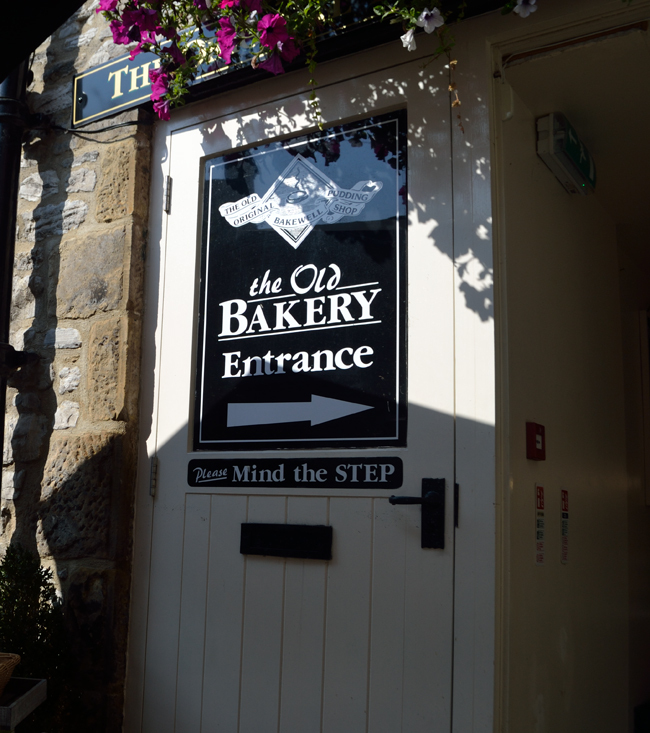 When I first arrived in Bakewell, a local shopkeeper had directed me to the Old Original Bakewell Pudding Shop. This she assured me, was where the original sweet was invented and where I would be able to get a taste of the real thing. Their sign does claim they’ve been guarding the secret recipe since 1865. But after I sampled their wares, I decided to take a little walk around the town. I discovered that Bakewell is apparently full of competing claims about who made the famous pudding first and where it was invented. Walk out the back of the Old Original Bakewell Pudding Shop and at least one other claimant is virtually next door. 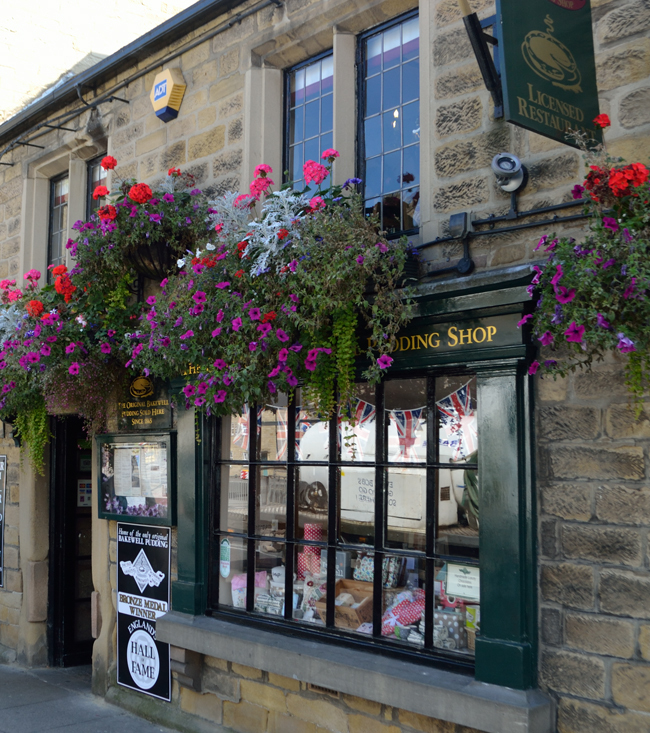 Nobody seems to argue that the first pudding in Bakewell was created by accident by a harried helper in the kitchens of the Rutland Arms Hotel, a local inn. They are still serving a posh version of the pud with raspberry coulis and ice cream in the hotel restaurant. At some point, the owner – or was it the son of the owner, or perhaps a new owner – passed the recipe on to a local baker and that’s where the arguments began. In addition to the Old Original, etc. 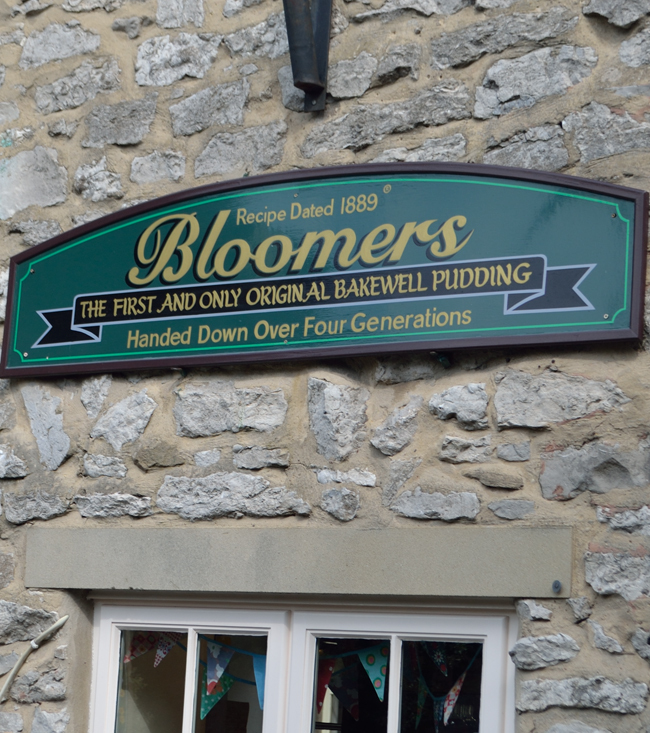 where I sampled mine, there’s Bloomers, practically next door. Their sign proclaims that they’ve passed the secret recipe down through four generations, since 1889, as “The First and Only, Original Bakewell Pudding.” They’ve even registered the name. 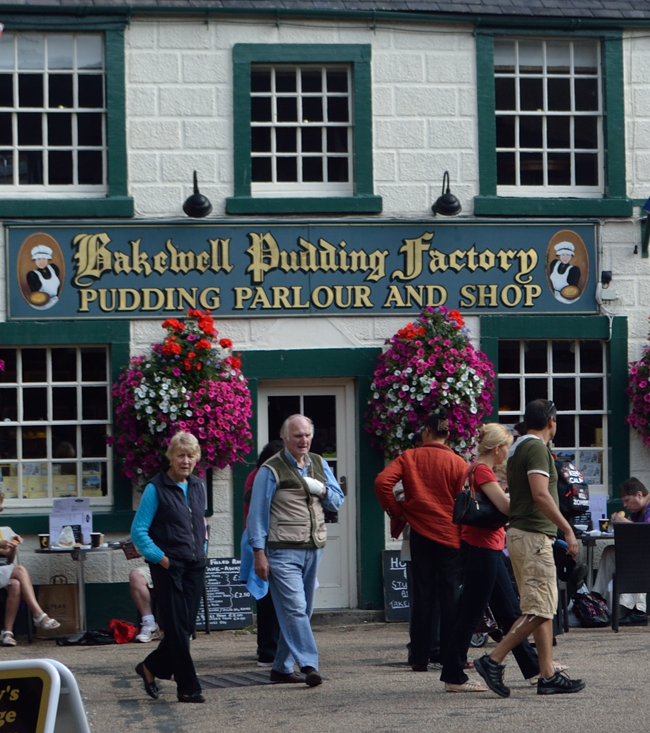 And right next to Bloomers is The Bakewell Pudding Factory, Pudding Parlour and Shop. They don’t claim to be originators, they just claim to have been making the confection for a long time – though they can’t make their minds up whether that’s been 80 years or just 20 – their website declares both within just a few sentences. While Bloomers declares, “This is the real thing, we don’t have tarts in our part of the world! Just puddings…”, I did spot the thick white icing and a candied cherry available by mail order from the website of another contender. You can read an amusingly po-faced account of the disputed history, written by Paul Hudson, great great great grandson of the owner of the Rutland Arms at the time the pudding was accidentally created, The Bakewell Pudding – Putting the Record Straight. On the other hand, why not just stop long enough in this pretty Peak District town to sample all four versions and see which one you like the best. Do be warned, however, until they are nicely warmed up and deliciously syrupy, Bakewell puddings in Bakewell look just awful. Full Disclosure: Some of the links in this article are affiliate links. 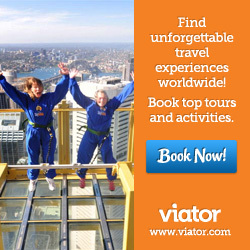 You can book accommodations or purchase products and services using these links at no extra cost to you, but we receive a small amount of money that helps support this site. Thank you. Now that I live in England I love the Bakewell tarts, before I had never heard of it. I am hoping to make it to the Peak District this summer so will have to try the “real” version.